Dyron L. Hart faces a possible five year sentence, for creating a fake Facebook page, pretending to be a white supremacist and sending out racial death threats about Obama to a black man in another university. All in a days work for the fake white supremacist brigade across Canada. An African-American man from Mississippi admits posing as a white supremacist to send a death threat across state lines by Facebook. The U.S. Attorney's Office says 20-year-old Dyron L. Hart of Poplarville pleaded guilty Wednesday in federal court to making a threat in November 2008. Hart admitted creating a name and using a white supremacists' photo to pose as a white man who planned to kill blacks because Barack Obama had been elected president. He originally was charged with threatening three black students at Nicholls State — where he had attended one semester — but pleaded guilty Wednesday to one count. He sent the threats from a computer in Poplarville. The maximum sentence is five years in prison and a $250,000 fine; sentencing is Nov. 18. (CNN) -- An African-American man has pleaded guilty after being accused of impersonating a white supremacist in a fictitious Facebook account to make death threats against an African-American university student. Dyron L. Hart, 20, of Poplarville, Mississippi, pleaded guilty Wednesday before U.S. District Judge Kurt D. Engelhardt to one count of communicating threats in interstate commerce, according to a Department of Justice statement. Hart admitted creating the fictitious account in November, pretending to be a white supremacist outraged by the election of Barack Obama as the nation's first African-American president, the statement said. He then transmitted a death threat via Facebook to an African-American student at Nicholls State University in Louisiana, saying he wanted to kill African-Americans because of Obama's election, according to the statement. A court document provided by the U.S. attorney's office said Hart told an FBI interviewer that he intended the threat to be a prank "to get a reaction." The document said Hart admitted creating the Facebook profile under the name "Colten Brodoux" and used a photo of a Caucasian man that he found on a white supremacist Web site. "This is an extremely odd case, a very unusual case," said U.S. Attorney Jim Letten of the Eastern District of Louisiana. "The contents of the messages were extremely troubling and provocative and very threatening." Hart will face a maximum sentence of five years in prison and a $250,000 fine when sentenced November 18, the statement said. [RadicalPress Comments: The Canadian Free Speech League, in regard to section 13(1) of the Canadian Human Rights Act, has decided to initiate a petition, (below) which they would like all concerned citizens to take as their personal commitment to communicate with the Honourable Rob Nicholson at the House of Commons in Ottawa. It is the CFSL’s proposal to have section 13(1) of the Act abolished. There is a growing awareness that this is a possibility, but Mr. Harper seems to think that he needs the constituency that supports 13(1), and he therefore is not likely to respond except to overwhelming public pressure. CFSL hopes that you will take the time to educate your friends, get them to sign the petition and then forward it immediately to Mr. Nicholson, but also send a copy to the Canadian Free Speech League so they know how many he has received. The CFSL will then be able to publish the results of this petition, which they hope gives overwhelming support for the abolition of sec 13(1) so that the government will at last pay attention. Please copy the petition and paste it into a file such as Word and print it off. 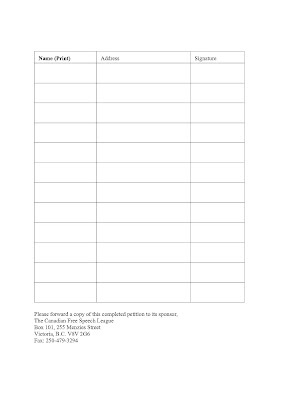 Add your own ruled and lined second page with the Name (Print), Address and Signature. Please then send or fax a copy to the Canadian Free Speech League. See address and fax number below. The Honourable Robert Nicholson, P.C., Q.C. Whereas Section 13(1) of the Canadian Human Rights Act has been amended since the Taylor case as a result of the anxiety created on September 11, 2001. And whereas Section 13(1) now applies to the Internet and all forms of communication on it, whether within Canada or not, whether true or not. And whereas Section 13(1) now applies to all mainstream media on the Internet and all commentary on controversial issues. And whereas the use of the Internet to receive and transmit alternative or dissident ideas and views is vital to prevent a monopoly by mainstream media. And whereas the Internet is voluntarily accessible and must be searched to retrieve dissident messages and is imposed on no one. And whereas the majority of Canadians are able to think for themselves and are otherwise entrusted in a democracy with many onerous choices, such as voting, abortion, religious affiliation or non-religious affiliation, driving, walking, reading, speaking, and thinking for ourselves, and are responsible for our own children to this point in time. And whereas Section 13(1) allows no defence to an offensive statement, a bona fide religious opinion, or an honest comment based on true facts, and allows no right to expression of a defence of another ethnic or religious group, all of which are provided as defences in Section 319(2) (hate speech) of the Criminal Code of Canada. Wherefore, the undersigned adult, tax-paying citizens of Canada are resolved and agreed that Section 13(1) of the Canadian Human Rights Act constitutes an insult to our intelligence, and delegates to a government bureaucrat of unknown political persuasion, the ability to decide for us questions, issues, and information we are quite capable of judging for ourselves. We are agreed this insult to our intelligence is open to abuse and has been abused by the bureaucracy of the Commission and its present and past employees, and no mere amendment of Section 13(1) could remedy this clear and present danger to our freedom. 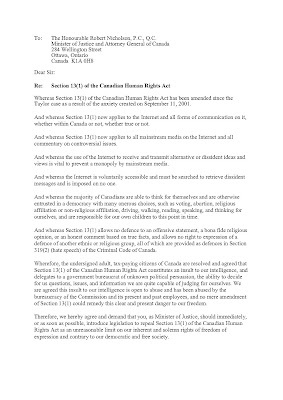 Therefore, we hereby agree and demand that you, as Minister of Justice, should immediately, or as soon as possible, introduce legislation to repeal Section 13(1) of the Canadian Human Rights Act as an unreasonable limit on our inherent and solemn rights of freedom of expression and contrary to our democratic and free society. Human Rights Commission - Good or Bad? This report takes a look at the history of the Human Rights Commission, talking to those for it and against it.